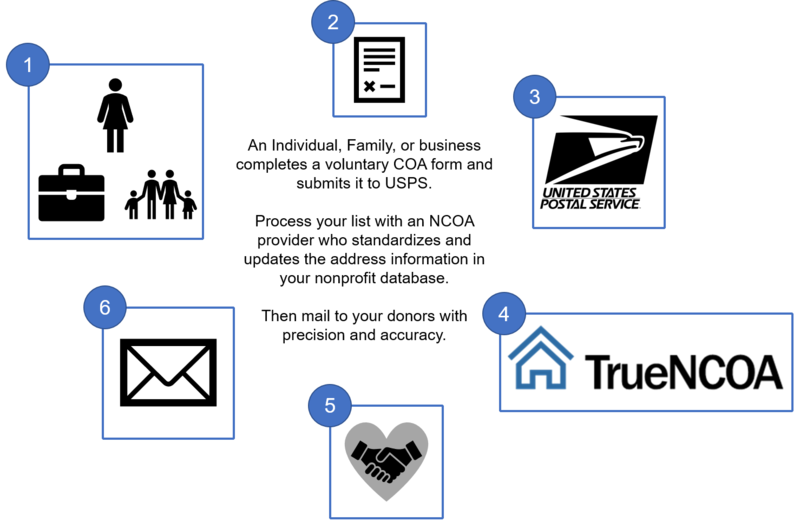 What is NCOA Link (National Change of Address)? NCOA (National Change of Address) or NCOALink is a data set containing approximately 160 million permanent change-of-address records filed with the United States Postal Service® in the last 48 months. This list consists of names and addresses of individuals, families, and businesses who have filed a change of address. In other words, consumers will fill out a change of address form online or at their local Post Office. As a result, USPS will apply that move and mail will now be forwarded to their new address. Consumers submit Change of Address forms to USPS voluntarily. NCOA processing makes that data available to organizations like yours. This process will return new updated addresses for individuals who moved in the previous 48-months. Read more about the benefits of using COA! TrueNCOA will save you at least $20 and keep you USPS compliant at no extra cost if you are mailing more than 850 records each year. Learn more about unlimited, flat rate service here or email support@truencoa.com with questions.